Please see below feeback from one of our clients who has recently returned from Spitsbergen. Fly to Oslo and overnight at the Comfort Hotel Runway, just 7 minutes from the airport. Central Oslo is just 20 minutes by airport train, should you wish to explore the capital. Within 3 hours, the early morning flight from Oslo to Longyearbyen transports you to the world’s northernmost airport. Self-transfer to your hotel for 4 nights. The remainder of your day is at leisure. We do recommend a visit to the Svalbard Museum in order to learn more about the fascinating history of this Arctic outpost. 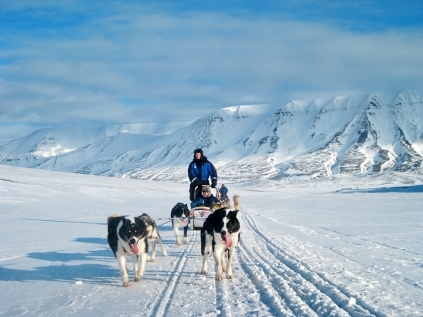 These 3 days are free for you to choose your Spitsbergen Adventure, Contrary to popular belief, it is not always dark. The mystical Polar Nights (when the sun does not rise above the horizon) last until mid-Feb. Residents consider this a special time, when the only light is from streetlamps, the reflections of the moon on the glistening snow or from the Northern Lights, which can show at any time of the day. By mid-March the archipelago is enjoying 12 hours of daylight, by mid-April the sun does not set. Self-transfer to Longyearbyen airport for your return flight to the UK. 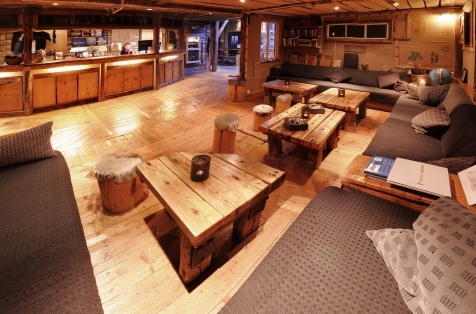 Built with reclaimed driftwood in a traditional, rustic trapper’s style and furnished with arctic bric-a-brac, the Trappers Lodge is a warm and welcoming retreat. All rooms have private WC/shower and are adorned with driftwood, sealskins and slate. In keeping with the trapper’s style there are no TV’s in the rooms. There is a well-stocked library of books to borrow and the Cognac lounge offers the opportunity to view the Northern Lights through the panoramic windows. Complimentary tea/coffee and small snacks are available in the lobby all day. Breakfast is served in the adjoining restaurant. This hotel was originally built for the Lillehammer Olympics and then transported to Svalbard, where it has become the world’s northernmost full service hotel. Recently refurbished, there is a wide range of warm contemporary rooms to choose from – all with free Wi-Fi. Restaurant Nansen features a la carte Arctic specialities and has panoramic windows looking out to Isfjord and Hiorthfjellet. Barentz Pub & Spiseri is a relaxed and informal meeting place for locals and visitors and offers a light menu. If that is not enough then there are also outdoor hot tubs and jacuzzi’s available for warming up after a day of activities. This tour will give you an insight to the history of Longyearbyen and its important international position. You will first be taken to the Longyear Valley and explore the town, before heading out to Adventdalen and Mine 7. This is followed by the airport district and Hotellneset. 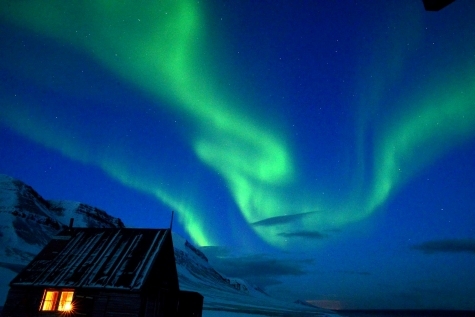 The Northern Lights can be seen 24 hours a day during the Polar Night. Escape any light pollution and head to Camp Barentz, where you will enjoy an Aurora Borealis presentation, as well as a delicious dinner and drinks. This tour takes you deep into the Advent Valley, near to the Mine 7 Mountain. Here you can see the EISCAT antennae, used to study the Earth’s atmosphere. Continue to keep a watchful eye out for the Aurora as you head to Camp Barentz for hot drinks and snacks on your way home. Join an exciting trip into the wilderness hunting for the Aurora Borealis. You will be picked up in an impressive red SnowCat, and then driven out into the darkness and across the snow-clad Advent Valley. Frequent stops are made en-route to the long-closed mining town of Hiorthhamn in order to look for the Northern Lights. The guides share their stories of the area whilst you enjoy a hot drink and startling landscape views. This trip starts with a 1½ snow shoe hike to the Lars Glacier, where equipped with headlamps, helmets, harnesses and crampons you will descend into a fascinating world below the ice. Walk along glistening crystal passages formed by the melting waters under the glacier. On this breathtaking journey, you will see mesmerising shapes formed of ice and stones. You need to have a good level of physical fitness to participate and may have to crawl in some places. 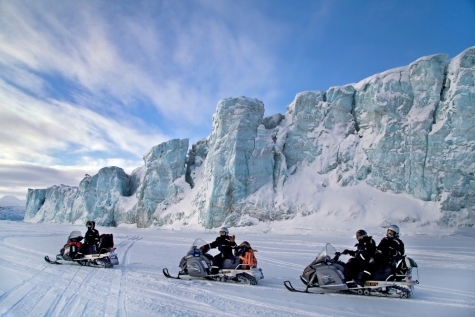 From 01 Feb this tour is operated by SnowCat, which takes you to an ice-cave in the Longyearbyen Glacier. This excursion requires an average level of fitness and is not suitable for those suffering from claustrophobia or restricted movement. 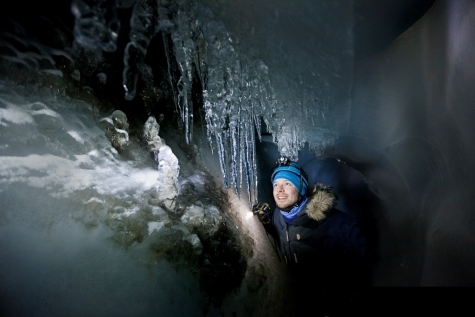 Helmets, headlamps and ice-spikes supplied.